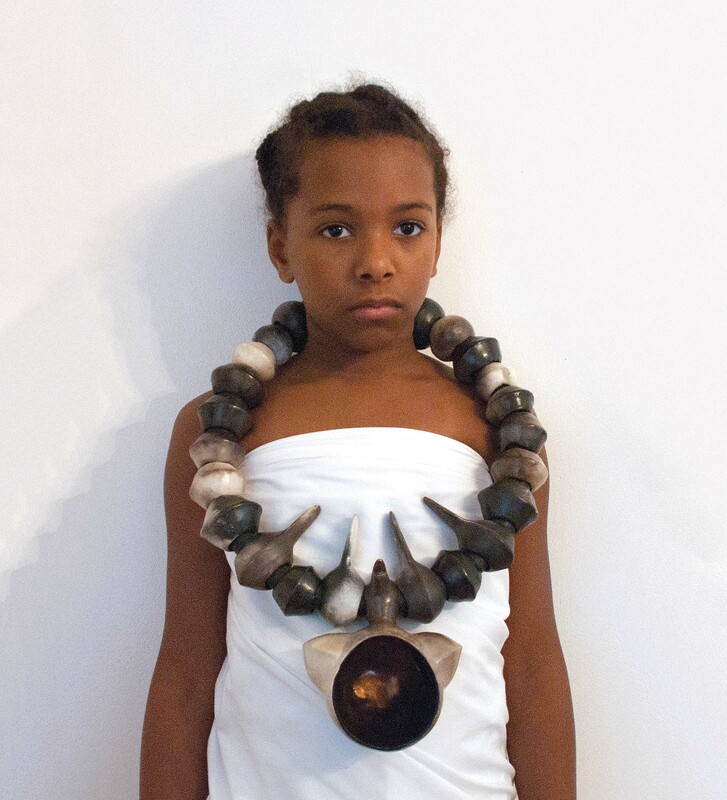 Sharif Bey applies a model of open engagement to his work as an artist and an educator. Published on Friday, September 2, 2016. This article appears in the August/September 2016 issue of American Craft Magazine. As a father of three, Bey can’t always hunker down at the wheel. He relies on pinching as a way to work anywhere. “The possibilities are boundless,” he says. He’d like to see the technique explored beyond introductory ceramics courses. 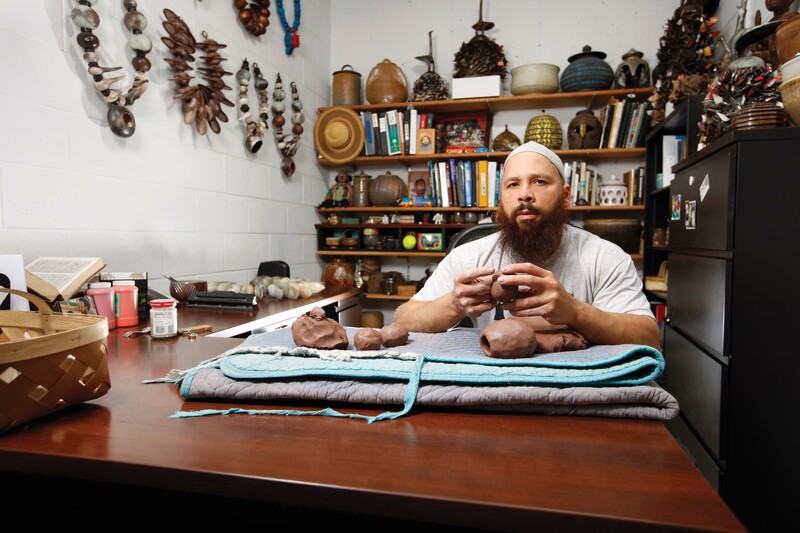 By the time he was in high school, Sharif Bey was serious about becoming a ceramist. Today a studio ceramist and associate professor of art education at Syracuse University, Bey can still picture himself at 15, making pots in a continuing education class near his hometown of Pittsburgh, alongside hobbyist retirees and art teachers there to fulfill professional requirements. Bey applies that model of open engagement to all aspects of his multifaceted career. 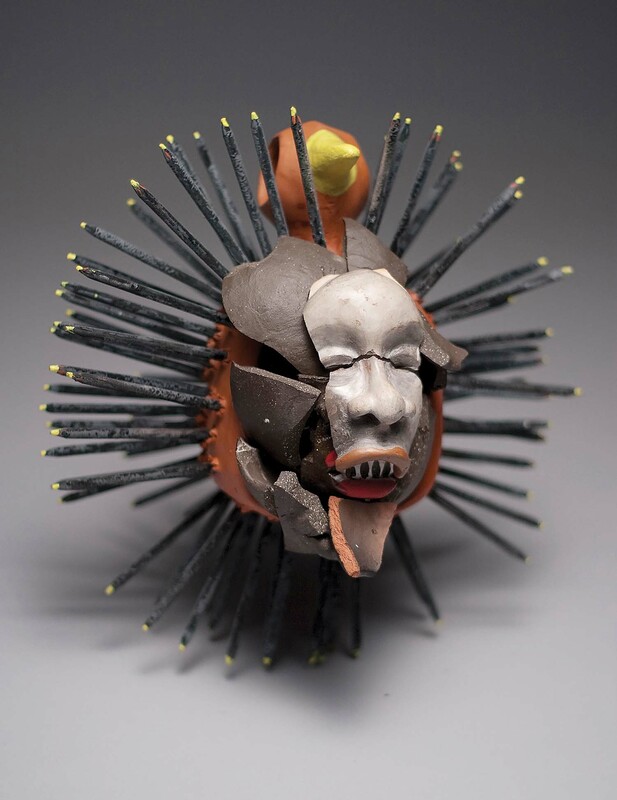 As an artist immersed in clay from a young age, he has taken his unique exposure to a diverse range of influences and synthesized them into original statements – various bodies of work that allow him to express dimensions of clay and of himself. 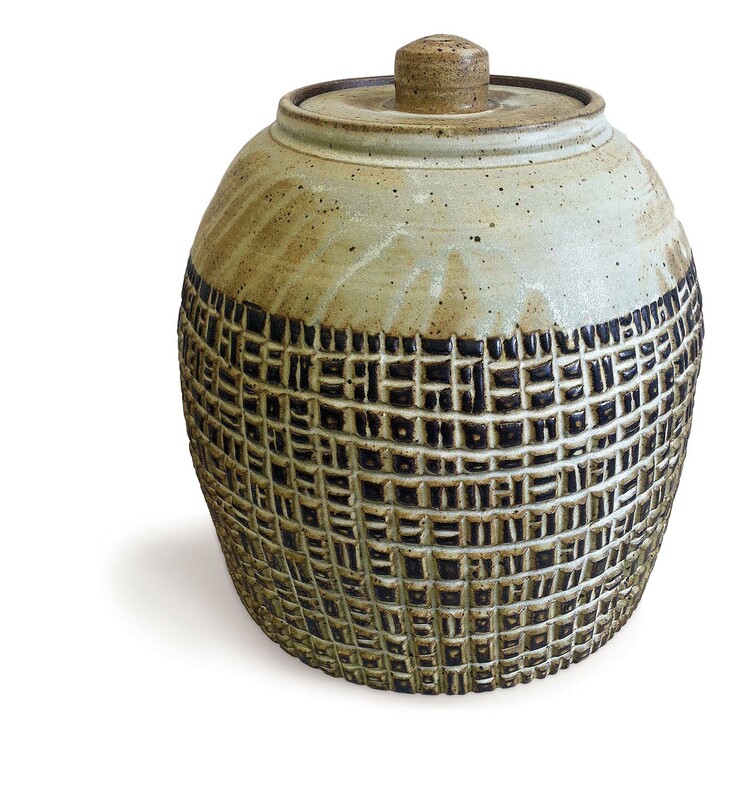 He considers himself a classical potter at heart, a maker of what he terms “subtle” functional wares and decorated vessels. 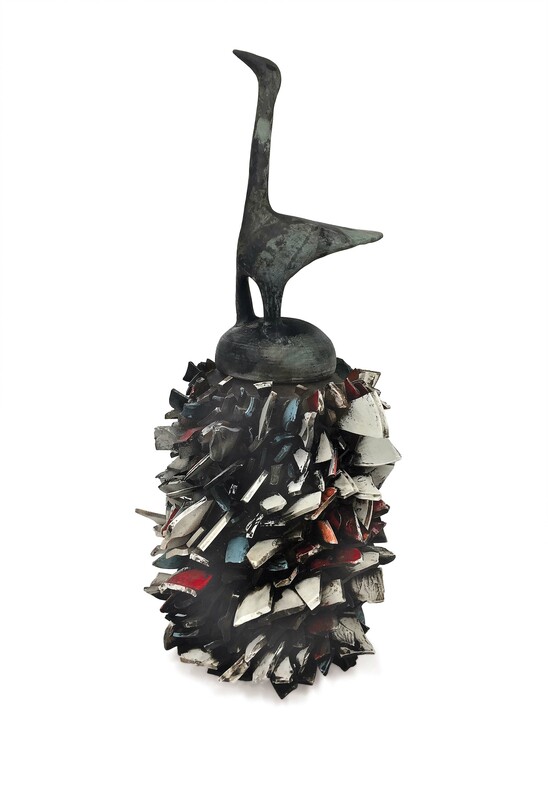 Yet he has also rebelled against convention, with striking figurative sculptures that combine ceramic forms with nails and metal and clay shards. He has mined social and political issues from his own perspective as an artist of color. 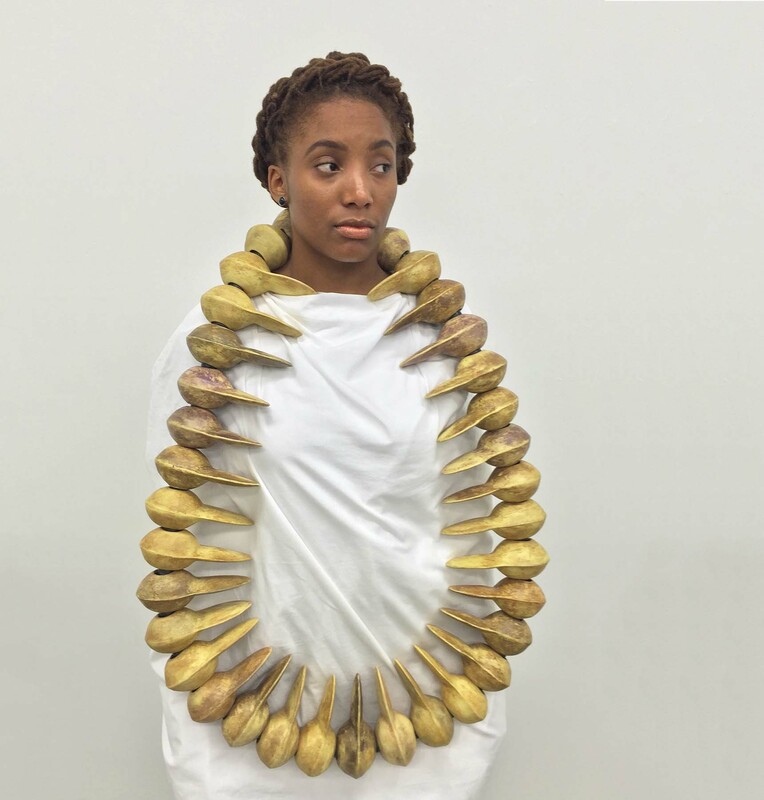 And in his series of dramatic neckpieces fashioned of oversized clay beads, he interprets traditional African adornment while exploring a new concept of what a ceramic form can be. That life is a busy one, encompassing frequent lectures and workshops along with his professorship. In other words, Bey makes art, teaches art, teaches teachers how to teach art, and researches and writes about it all for scholarly journals. By nature and necessity, he’s a multitasker, happy doing several things at once. He’ll pinch clay while giving a talk, spend time with his wife and three kids during a firing session in his backyard barbecue pit, tinker under the hood of his beloved 1984 BMW as he’s interviewed for a magazine. Underpinning his many endeavors, say those who know him, is a formidable work ethic and drive. “Sharif is a calm yet intense artist, scholar, and person, as dedicated to his studio practice as he is to his academic scholarship. I know few artists and educators who work as hard and are as successful at both,” says B. Stephen Carpenter II, professor of art education and African American studies at Penn State University. One of 13 children, Bey grew up in a working-class neighborhood in Pittsburgh. While there was artistic talent in the family (he still has some intricate wood totems his father whittled in the 1940s), most of his brothers became welders. Young Sharif was good at drawing monsters and superheroes, and in third grade, an art teacher recommended him for Saturday classes at the Carnegie Museum of Art (where Andy Warhol and Philip Pearlstein also had gone as kids). He ended up attending a creative arts middle school, as well as a pre-college arts program at Carnegie Mellon University. At 14, just as he was itching to swap art for sports, the local Manchester Craftsmen’s Guild recruited him for its after-school apprenticeship program in pottery, and clay quickly became his passion. The guild played a formative role for Bey throughout his teens, giving him a foundation of skills, extensive ceramics-world connections, and exposure to a who’s who of visiting masters – the likes of Ron Nagle, Jun Kaneko, Karen Karnes, Edward Eberle, Norm Schulman, David Shaner, Judy Moonelis, and Paul Soldner, to name just a few. “I saw such a gamut of processes and rhythms of working in clay, different trajectories to consider,” he says. 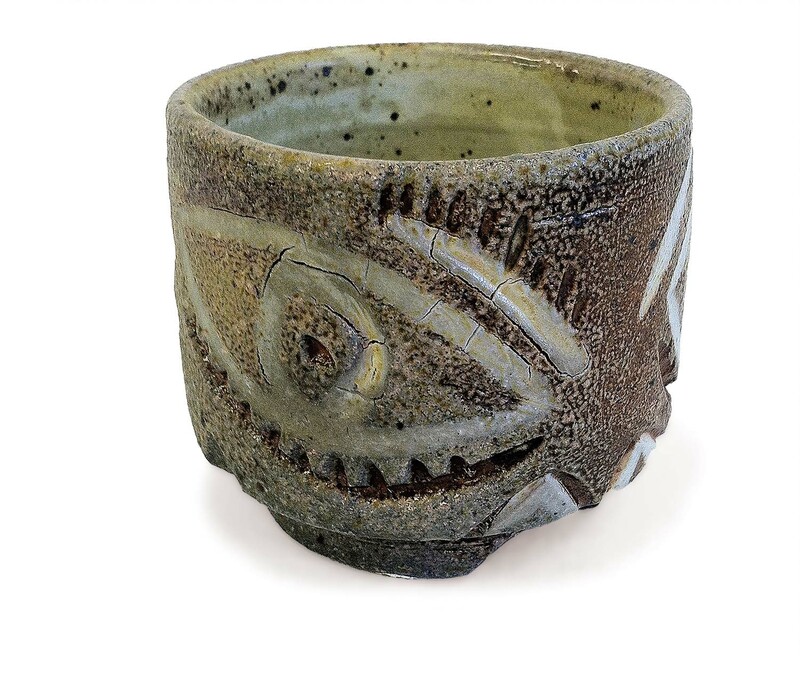 With an eye to becoming both an artist and an academic, he earned his undergraduate degree in ceramics at Slippery Rock University of Pennsylvania, and began to expand his artistic vision, traveling to Europe (he would later get a Fulbright grant for a residency in Slovakia) and experimenting with amorphous forms and alternative materials, such as bronze. He enrolled at the University of North Carolina for his MFA, where he continued to stretch and question the clay canon. Meanwhile, on visits back to Pittsburgh, he saw his old neighborhood fall to what he describes as “gangs and crack and drive-by shootings and police brutality,” prompting him to reevaluate his own situation. After grad school, Bey came home to clay, so to speak, returning to the Manchester Craftsmen’s Guild to run its ceramics youth program and act as a teaching artist in public schools. With a fresh sense of purpose, he set about creating an open studio environment for his students, one where “we hang out, order pizza or Chinese, talk about life, and make things.” In 2002, when the chance arose to pursue a PhD in art education at Penn State, he was ready to study that model in depth. It was that integration of creativity and everyday life – as opposed to artmaking as a discrete, isolated experience – that prompted Bey’s move into wearable pieces. He was in the thick of his doctoral work, teaching on the side, and he and his wife had a toddler and a newborn. He had little time or focus to throw pots, “which drove me nuts, because this is who I am.” So he changed his way of working, began pinching clay by hand into small containers – something he could do in his living room while the kids played. Inspired by a photo of a Berber princess wearing an opulent neckpiece of giant chunks of amber, he took to stringing the pinch pots on PVC tubing. 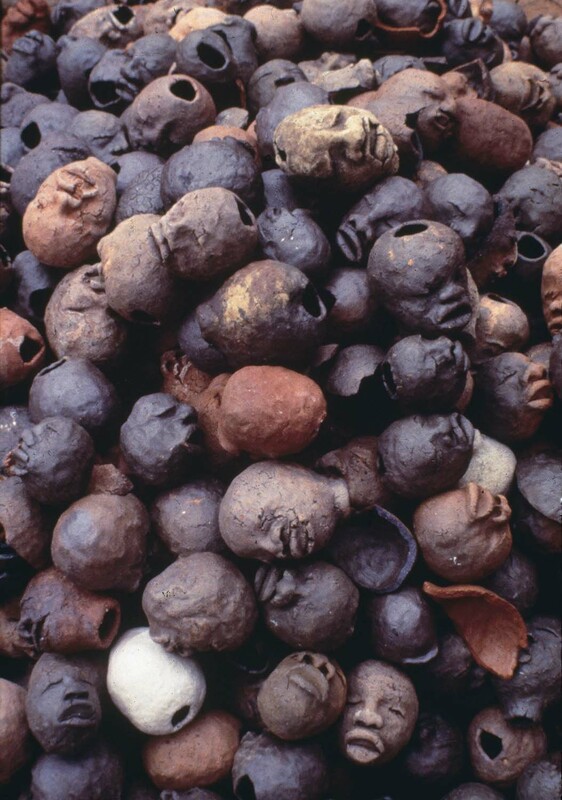 With that mindset, Bey realized, he could pay homage to virtually any idea or form – for example, his sculptures of heads embedded with nails are a nod to African nkisi, or spirit figures, as well as ceremonial vessels. In the end, it’s not solely the materiality of objects that interests him, but also the making, and the actions and ceremonies we associate with them, which express who we are. Copper Cherry, 2016, vitreous china, mixed media, 23 x 23 x 2.5 in. 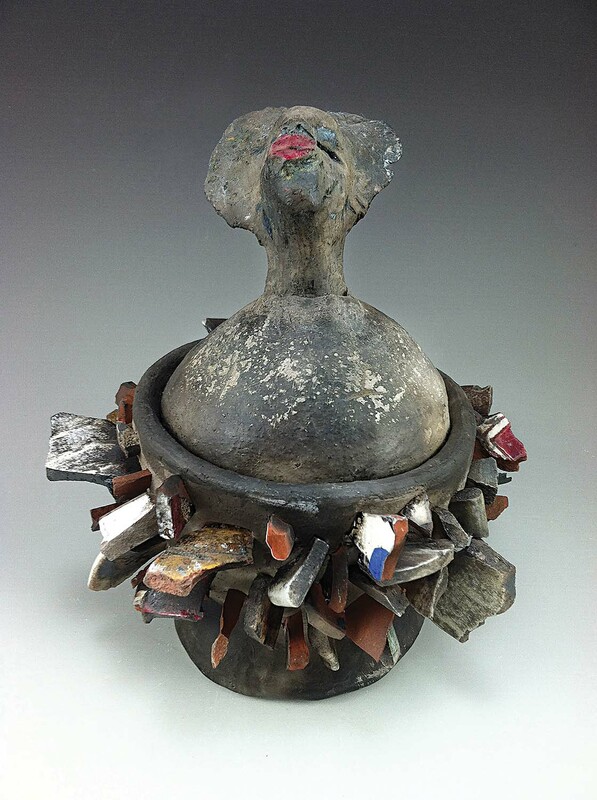 Copper Bird I, 2011, earthenware, mixed media, 16 x 16 x 4 in. Ripened Banana, 2014, vitreous china, mixed media, 33 x 29 x 2.5 in. Candy (2013) repurposes a broken figurative form and shards from broken student work. Most of Sharif Bey’s handbuilt works require little space, which the prolific artist has turned to his advantage, using a blanket as a makeshift studio anywhere he needs, including his university office. 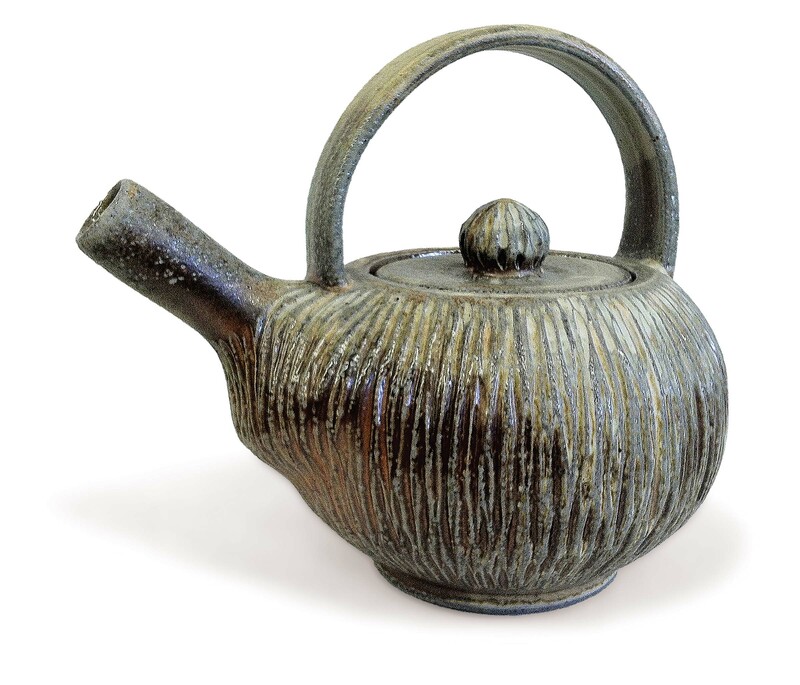 Teapot, 2015, soda-fired stoneware, 9 x 7 in. dia. Bourbon Bowl, 2015, soda-fired stoneware, porcelain inlay, 3 x 4 in. dia. 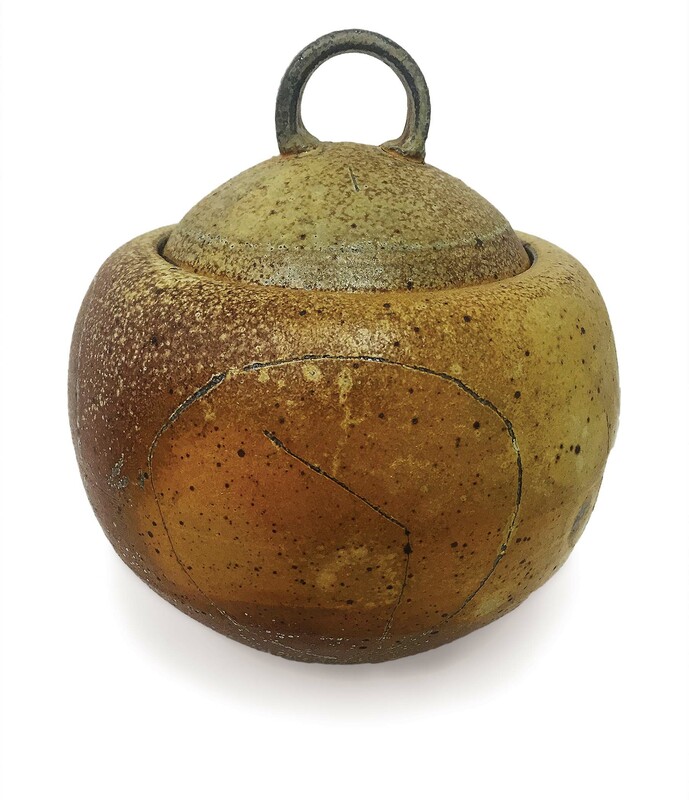 Acorn Jar, 2014, soda-fired stoneware, 7 x 6 in. dia. Basket Jar, 2015, salt-fired stoneware, 11 x 10 in. dia. Bey is an avid collector of West African sculpture; the bird form of Ceremonial Vessel I (2016) reminds him of the motifs of Baule Goli masks from Ivory Coast. For his MFA thesis, Bey created Assimilation? Destruction? (2000), one of his earliest pieces with shards. Each head in the pile represents a part of African American history; each time the work is installed, the forms break into more fragments. 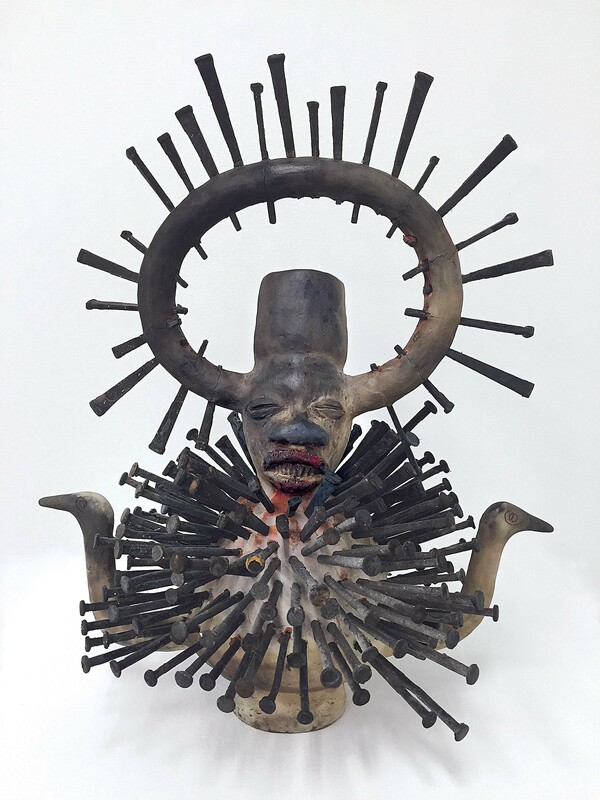 The Oviary II (2016) is a nod to nkisi, spirit figures of central Africa. 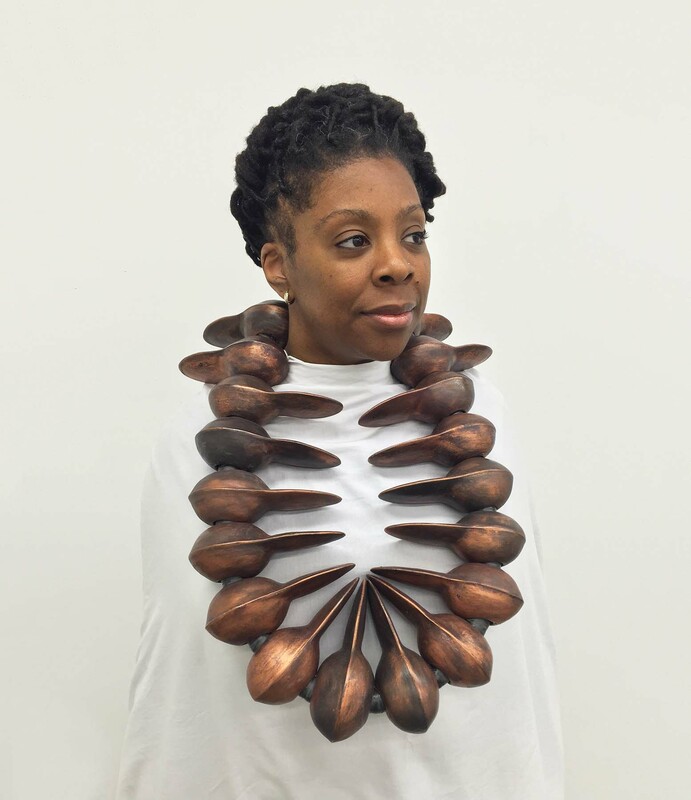 "Sharif's sculptural objects challenge cultural and historical issues, and cross boundaries of design, ethnography, and contemporary art," says Kate Lydon, director of exhibitions of the Society for Contemporary Craft, which in 2008 included his work in its traveling show "Color: Ten African American Artists."